Snapchat announced that third party developers will soon be able to integrate its Stories feature into third party apps. Most notably, dating app Tinder will be among the first apps to debut the feature. According to The Verge, Tinder plans its Stories rollout this summer. Snapchat Stories is the defining feature of the Snapchat app, where users could post videos and photos that would automatically disappear in 24 hours. The service became incredibly popular after it launched, especially among young people who preferred its platform to Facebook, which at the time didn’t have its own stories feature. Snapchat’s new “App Stories” will be an extension of the Snap Kit developer platform, which allows third party apps like Tinder to integrate Snapchat features into their services. 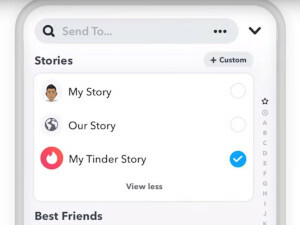 With App Stories, Tinder users will be able to post stories they created in Snapchat to their Tinder accounts seamlessly, similar to sharing a Spotify track on Instagram, according to The Verge. Snapchat is also expanding the developer platform’s Creative Kit to allow developers to build custom branded stickers, filters and links that can be shared through Snap Camera, which is central to Snapchat’s Stories feature. For example, users can create a video and add custom art to their story and send it to friends on Snapchat. They will soon be able to do this over other apps as well, like FitBit and Venmo. Snapchat is also rolling out Bitmoji to third party apps. "Over the past few years, many of our partners have been telling us they wanted to bring Stories to their services," Ben Schwerin, VP of Partnerships at Snap told Business Insider. "With App Stories, Snapchatters can post to a custom Story in any partner app, right from their Snapchat camera." More than 200 apps have used the Snap Kit developer platform since it debuted in 2018, according to Business Insider. Adding Snapchat’s signature technology to the platform is a bold and important move, according to Business Insider. Facebook and Instagram both debuted their own Stories feature inside their platforms, which have become hugely popular among users. Since the Instagram Stories debut, Snapchat’s growth has dwindled, so the company is trying a unique strategy: to make its technology ubiquitous. This is a decidedly different approach from Facebook, and with it they hope to regain some of Snapchat’s initial appeal. Snapchat also took a $1.3 Billion hit to its stock last year when after its redesign, Kylie Jenner tweeted, "Sooo does anyone else not open Snapchat anymore? Or is it just me... ugh this is so sad." Snapchat’s new focus on its developer platform seems to be a good move, especially with popular apps like Tinder taking part. For more on this dating service, you can read our Tinder app review.